Eating bread fresh from the oven with a meal is a small luxury. For one person, doing all the cooking for that meal, it should be nigh-on impossible to arrange. Especially if the meal is a multi-course dinner or lunch and the bread is to go with soup or salad. However, it is not impossible–or even difficult. Swiss Soft Rolls are extremely user-friendly. 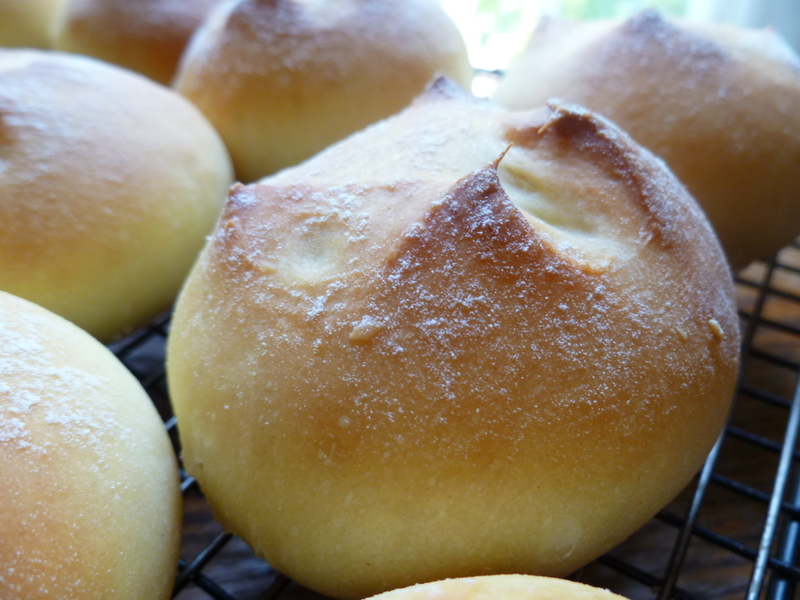 The recipe for these rolls belongs to a pastry chef who did his apprenticeship in a Swiss hotel and learned to make them there. Hence, the name. He had been hired to run the baking side of the kitchen in a new hotel in southwestern China. It was not the peak tourist season and anyway, the hotel was just barely open. So he was not too busy to notice the family of six who came down to breakfast every morning and ate a lot of those rolls. This chef was enthusiastic about what he did for a living and invited a member of the family to come to the kitchen one afternoon and learn how to make the rolls they liked so much. A Note about the Ingredients and Equipment: Unlike most diplomatickitchen recipes, this one is given in metric measurements and the butter and all the dry ingredients are weighed on a digital kitchen scale and transferred to the bowl of a mixer. 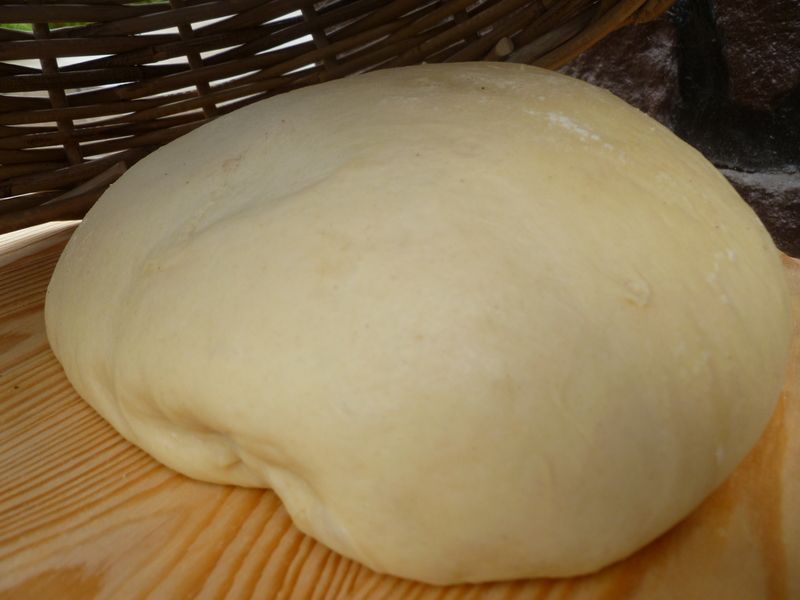 There is less variation in the dough using this method. 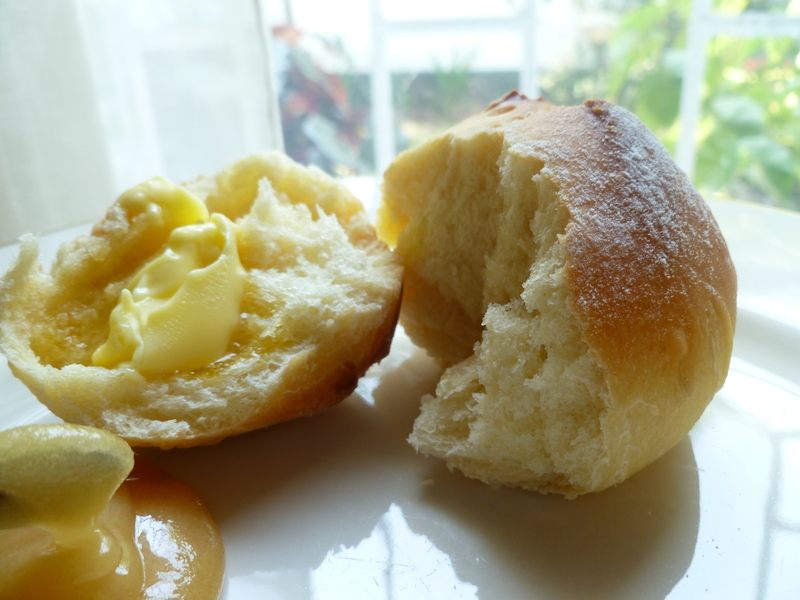 Also, the rolls are easy to make of uniform size by cutting and weighing the pieces of dough. Having acquired a digital scale for the sole purpose of making these rolls, I subsequently came to appreciate its many other uses. It pulls its weight in a kitchen. But if only for the occasional dozen rolls , I would count mine worth having. A mixer with a dough hook, such as a KitchenAid: This kind of mixer is convenient for making the rolls but not essential. The recipe directions describe how to make the rolls using one of these mixers, but everything could also be done by hand. A bottle of water with a spray nozzle, to spray the rolls before and during baking. This feature may also be dispensed with. Spraying the rolls will give them a better crust–and it is fun–but they will be good without doing it, too. 1. Measure all the dry ingredients into the mixing bowl except the salt and mix them well, using the flat beater attachment. 2. Add the salt and mix. 3. With the mixer set on a low speed, add the eggs, one at a time. 4. Slowly add a little over half of the water. 5. Increase the mixing speed and add the butter. 6. Increase the mixing speed again and continue adding the water slowly. 7. Replace the flat beater attachment with the dough hook and knead the dough until it is elastic and pulls away from the sides of the bowl. 8. 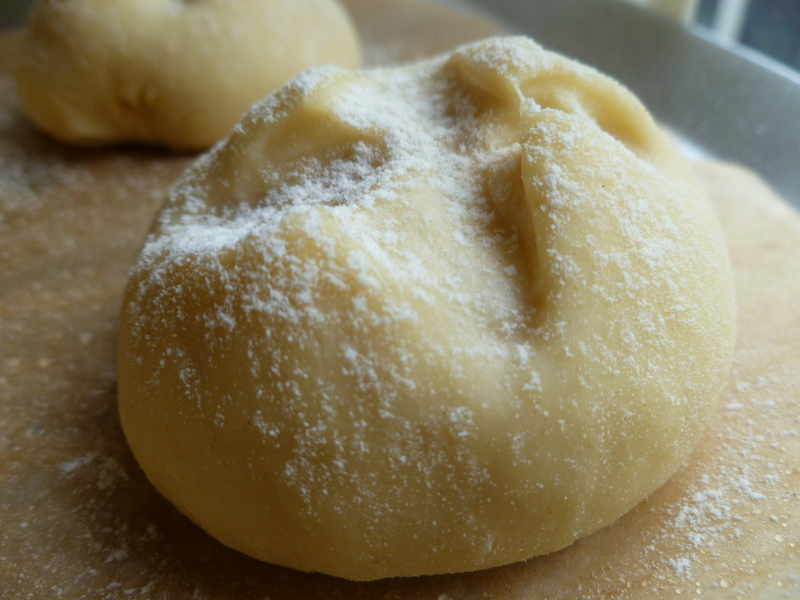 Shape the dough into rolls. (The ones in the photos are formed from pieces of dough weighing about 50 grams each.) 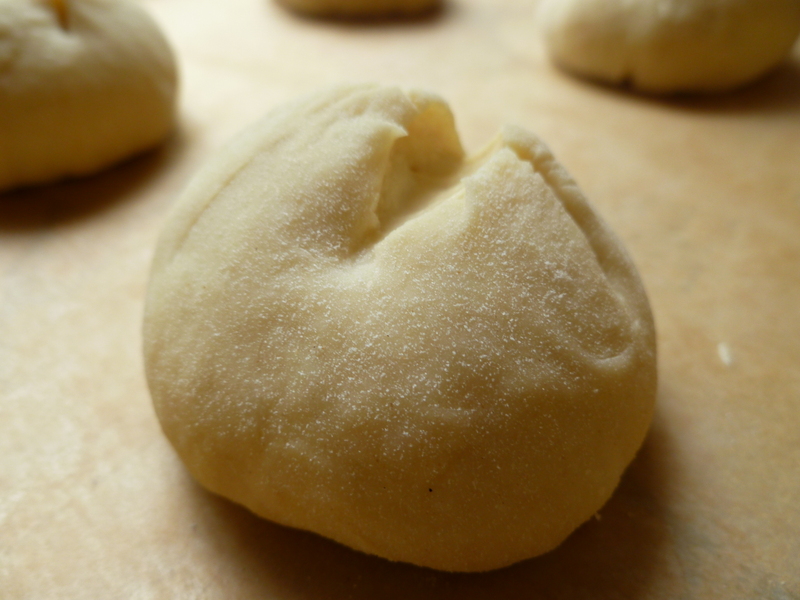 Roll each piece into a ball, pinching the dough together at the bottom to tighten the surface of the ball. 1. Form the rolls and cut crosses in them. Instead of letting them rise, cover them with plastic wrap and freeze them until the day you want to bake them. The rolls will thaw and rise in approximately four hours, but once ready to bake, can wait at room temperature longer than that before going in the oven. 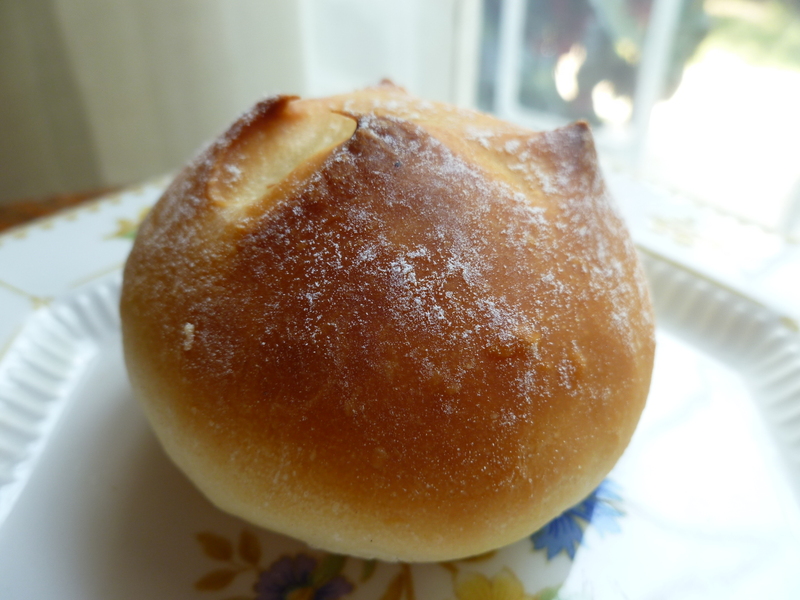 A Note: The dough for Swiss Soft Rolls is used to make Petits Cochons ~ Little Pigs, an hors d’oeuvres in the Dinner Menu: Dinner at Summer’s End.